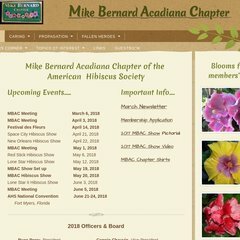 Topics: Mike Bernard Acadiana Chapter, Fallen Hero Project, Hibiscus Competition, and Minutes. It is hosted by Webs.com Maryland, using Apache-Coyote/1 web server. It has 2 DNS records, ns1.webs.com, and ns2.webs.com. Its IP Number is 216.52.115.5.